Ticks are external parasites, and globally they rival only mosquitos as carriers of disease. Their natural habitat is thick grass – fields, meadows, farmland and woods are all favourite locations. Parasites live by feeding off a host, and as they move from one to another they quickly and easily pick up and spread diseases, so it’s really important to have a continuous protection against ticks in place such as the monthly spot-on treatment for fleas and ticks that are available from us. You can save money on this if you’re a member of our Healthy Pet Club. What do ticks look like and can I spot them whilst out? Ticks change shape as they feed, starting off the size and shape of a small seed but growing to the size of a baked bean once they’ve fed from their host. They vary in colour as well as shape and size but are often a dull brown or grey. Whilst in their natural environment and are waiting for their next host to walk by (they often climb to the top of a blade of grass and wait for any passing animal or human) they’re so tiny that they’re unlikely to be spotted. What diseases do ticks carry and can they cause other problems? Problems range from itchiness and local infection to a disease that can have lifelong consequences for your pet, and for your family if a tick decides to make you its host. Ticks produce a mucous that they use on the feeding site to help them stay on, and this can be really irritating for your pet. If they then scratch themselves to get the tick off, they can make themselves bleed, get an infection in the broken skin, and possibly scratch the tick off but leave part of it inside them that then gets infected. There have also been cases of anaemia in badly infested pets, and reports of some female ticks releasing a toxin that can result in paralysis, but thankfully these are rare. One of the biggest and most serious threats is from Lyme disease which is caused by very resilient bacteria. The symptoms of this are arthritis, painful swollen joints and lameness. In humans, the symptoms are often a rash, joint pain, fever, and headaches. As these are all common to many different diseases diagnosis can sometimes take a while, or be missed completely. If this disease is left untreated, it can lead to an extremely serious debilitating chronic illness with permanent complications. Are ticks a seasonal problem? Ticks are often more active in spring and autumn when it’s warm and damp, but they can be found all year round. With a 75% increase in pets coming into the UK, we are now seeing the emergence of foreign ticks such as the kennel tick on recently travelled dogs, so it’s now even more important to protect your pet. Regular grooming and vigilance should help you identify any unwelcome visitors. Always brush your pet against the hair growth as well as with to help you identify any embedded ticks, and carefully check awkward areas such as their ears, face and paw pads. If you spot one, don’t panic, and don’t pull it straight off as embedded mouthparts can be left behind and cause further problems. It’s also important not to do anything that makes the tick feel stress, as they can often regurgitate their meal back into the host along with any diseases they’re carrying. 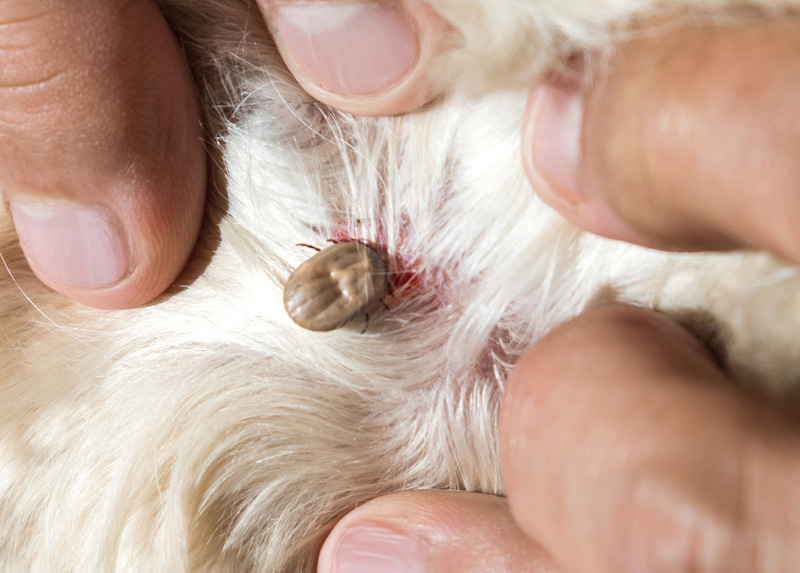 All of these methods would cause stress to the tick and that could further harm your pet. It’s a good idea to have a ‘tick removal kit’ ready at home so you don’t have to spend time getting everything together if you do identify a tick. Put on your gloves. As ticks spread disease through the bloodstream they could infect you through any broken skin. Hold your pet and make sure they are calm. They’re going to have to remain still for a minute or so to allow you to remove the parasite. Get someone to hold the pet for you if you can. Place your removal tool or tweezers around the part of the tick closest to your pet’s body – be careful not to pinch your pet’s skin. Using a steady pressure, gently pull the tick out. as you don’t want the tick to regurgitate whatever is inside it back into your pet, or for any of it to be left behind. Put the tick in the jar and examine it to check it’s still in one piece and nothing has been left inside your pet. Add some rubbing alcohol (vodka would do but it seems a waste!) to kill the tick. Keep it in the jar somewhere for a few days until you’re sure your pet is OK. If they display any symptoms such as a reluctance to move, fever, extreme tiredness, loss of appetite and swollen lymph nodes then bring both them and the tick to us straight away so we can check them over and be sure of the parasite that infected them. Disinfect the bite area with the antiseptic wipes or some fresh rubbing alcohol. Keep an eye on the bite area and contact us if it becomes red or inflamed. Can I stop my pet getting ticks? Yes, and prevention is so much better than hoping to spot one on your pet and successfully remove it before it has spread disease. You can use a simple treatment that works in the same way as flea protection. The substance will penetrate the fatty, subcutaneous layer just under the pet’s skin and give them a dose of the anti-parasitic drug as soon as the tick first feeds. As ticks pass on disease within the first 24 hours of attaching to a host, it’s really important to kill them off as soon as possible and the only reliable way of doing this is through a continuous protection programme. Call us on 01980 621 999 to talk about the options, and don’t forget to ask about the cost savings as a Healthy Pet Club member if you aren’t already a member.